Occasionally in the presence of injury, deformity or other anatomical disorder, it may be necessary for the person to undergo surgery of the foot.This may be performed as an in-patient, day patient, out-patient or even within your GP surgery; this will depend on a variety of different issues. Someone who has other medical problems that will require closer observation by the medical team, or those having surgery on both limbs simultaneously will often have to be treated as an in-patient. For those having simple surgery or surgery requiring purely a local anaesthetic will often be treated as a day or out- patient. As many GP surgery’s are now offering an extension of services and specialities, there has been, and continues to be, many more treatments available at your local surgery. Staffed by highly trained professionals, the government is trying to develop this area so that visits to hospitals for minor procedures will not be necessary in the future. The nature of the surgery will depend greatly on the particular problem, severity, and what is hoped to be achieved by having the surgery. Thorough discussion between the patient, GP, surgeon and carers will be needed to discuss the surgery before a decision on the best and most appropriate location is made. 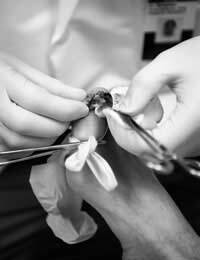 Foot surgery is an area that requires a highly trained practitioner who has chosen to specialise in this field. The foot is a complex part of the anatomy and has a great many responsibilities, such as maintaining balance, permitting movement and allowing us to be flexible among many other functions. Surgery of the feet may be because of a trauma or injury. This may involve purely the soft tissues, or may incorporate a bone injury also. Many injuries will require the wound to be cleaned, assessed for the presence of a foreign body or bleeding and stitched or glued together, whilst other injuries may involve the use of screws, wires or other mechanical devices designed to correct and reduce fractures of the bones. Those with deformities may also benefit from undergoing surgery on the affected foot and this may involve the use of ligaments and tendons being either stretched or cut, sometimes necessitating the reattachment of the tissues to a more suitable location. For those with bone spurs, the surgeon will remove the excess bone either by chipping, cutting or shaving the extra bony prominence. The list for the differing types of foot surgery is extremely long and varied and is largely dependable on the problems that are being experienced by the patient. As with most surgeries, patients are always advised that they are likely to experience some degree of discomfort. Most pain can be controlled with a well planned pain management programme and the patient should not be afraid to take pain relief as needed, but it is still probable that some discomfort will arise, often on mobilisation. The wound will be dressed with an appropriate dressing and will possibly be protected from injury by several layers of bandages or a plaster cast.For those having both limbs operated on or those with mobility problems walking aids such as crutches may be advised. For any type of injury or surgery, it is recommend that the individual elevates the affected limb when able and avoids any restrictive clothing or footwear. When bathing is possible, the affected limb should be wrapped in cellophane or other waterproof covering to prevent contamination of the wound and destruction of the dressing. Though foot surgery is a highly specialised area, most procedures are fairly minor and will not carry exceedingly dangerous risks. For many people who have suffered with foot problems for many years, it can significantly improve their quality of life.